Musician with extraordinary creative power, Vivaldi composed over 450 concerts for all the instruments used both individually and in groups. A great violinist, as well as a composer, conductor, teacher and even a theatrical producer, he gave an important and decisive contribution to the formulation and the determination of the classical laws of the solo concert. He developed his instrumental technique enormously and ended up transforming the big baroque concert into a solo concert and into a real orchestral concert as well. No less important than the instrumental production is the sacred one of Vivaldi, comprising compositions respecting traditional forms, but marked by an accentuated variety in the harmonization of the voices, particularly expressive in moments of greater polyphonic expansion, as the superb Magnificat attests together with the bright Gloria. 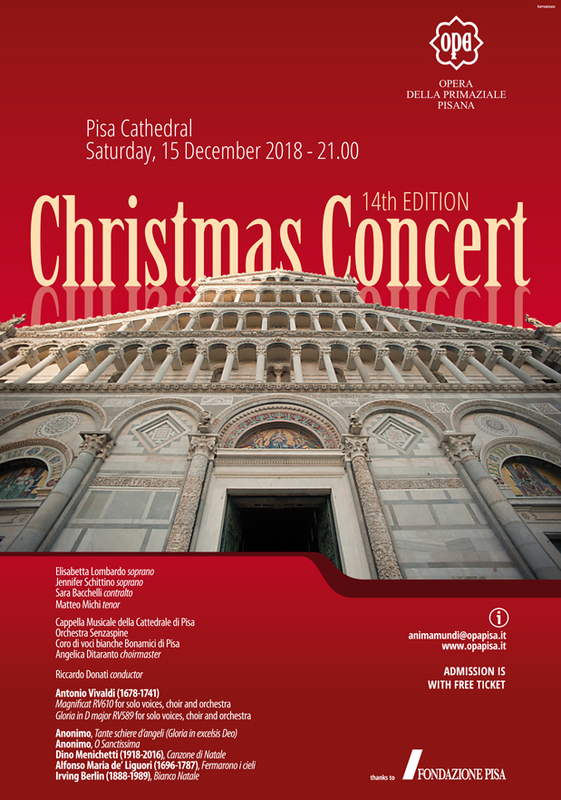 The free entrance tickets (max 2 per person) can be picked up only at the Sinopie Museum on 14 and 15 December from 9 to 17:30 and the evening of the concert from 19:30 to 20:50 while seats last. You cannot make telephone reservations or by e-mail. There is no special area reserved for disabled persons; tickets are free for everyone. Those with restricted mobility and wheelchair users only who wish to attend the concerts should email to ensure that appropriate spaces are available, in compliance with safety regulations.